Just like gloves, one size doesn’t fit all when it comes to buying a handicap bathtub either. 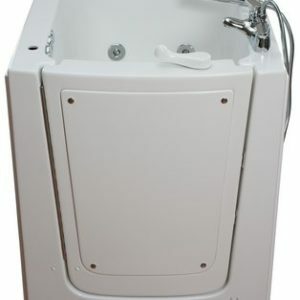 Aging Safely Baths sells top quality handicap tubs that are designed specifically with seniors and the disabled in mind. While some of our more modern contemporary walk in baths might not be the best solution for all, others will appreciate the simplistic functionality to our certified bathroom safety products for the elderly and disabled. Several of our walk in bathtubs can come without hydrotherapy jets as well. For some people a soaker tub is all they want. A place to take a nice warm bath without having to step over a tall sidewall to a bathtub. We have handicap bath options for almost all needs. Take a look at one of our traditional step in bathtubs here. Several of our hydrotherapy handicapped bathtubs can be installed into your home or your business. In most cases, extensive construction isn’t required to retrofit a walk in tub into a residential home. Likewise for new construction and commercial applications, the installation typically can be done without major remodeling. We know you want a good value for your investment. That’s why Aging Safely only supplies products that we would want in our own homes as well. Having confidence in your handicap bath or walk in shower stall is important. We want you to enjoy your safety bath for years to come. We strive to always provide old fashion one on one customer service. Making you happy is our number one priority. Our disabled baths can add peace of mind for some people that may have a fear of falling in the bathtub. No one wants to be scared of taking a bath. Being able to enjoy an accessible bathtub shouldn’t be for the limited few, but something that anyone should be allowed to experience. Handicap bathrooms don’t need to look institutional. They can be modern and made to match just about any decor or bathroom style. Safety is what really matters most here, but having a beautiful bathtub is important too. You will enjoy one of the largest selections of walk in tubs and handicap showers available anywhere. Whether you are in need of a really big walk in tub that you can soak deeply in, or a smaller more compact unit; we have the options you are looking for. Not only do we want to you buy the walk in bath product that is just right for your unique needs, but we also strive to offer the best prices nationally on all of our handicap bathing products. We are dedicated to offering the best value on the market. Top quality handicap tubs and wheelchair accessible showers, at the best price. This walk in bath can be the finishing touch to a custom designed handicap bathroom.